As elegant and enchanting as a spiders web, the Spell Spinner Blouse hosts a magical air that is sure to ensnare only the best of prey. Adorned in this mystical garb, a dark sorceress lies in wait for the perfect moment to strike. 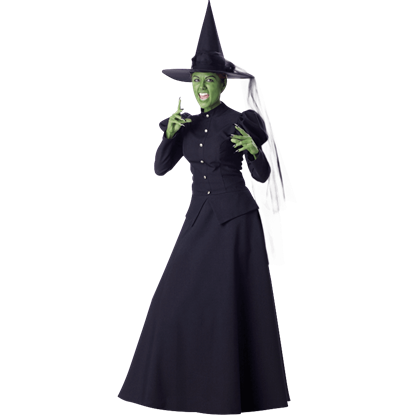 Grab ahold of your trusted broom and throw in a good cackle or two, while arrayed in the Womens Spellbound Costume. Add to the bewitching atmosphere of the spookiest Halloween night the crowd has experienced with this stylish set. It is not typically a compliment when someone tells you that you look like a wicked witch. But then again, if you are wearing the Wicked Witch Women's Costume, you can always just smile, cackle, and take it as a compliment, anyways. Desdemona gave her reflection a sly smile. This Womens Desdemona Witch Costume would be just the thing for the new sorceress calendar, Pentacular Pinups. Setting her peaked hat at a jaunty angle, she sailed off on her trusty broom. Being wicked cannot be that bad when it looks this good! The Womens Enchanting Witch Costume allows you to dress as a sultry witch in this ruffled blue and black dress, allowing you to dabble in the dark arts. You will be a true Black Widow when you show off the Womens Enchantra Witch Costume this Halloween. 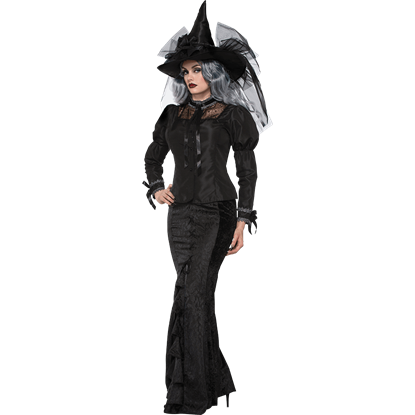 This sultry witch costume offers a flattering fit along with its spooky look, featuring a green applique spider over the chest. You will cast a spell on the room when you show up to the Halloween party wearing this stunning costume gown. 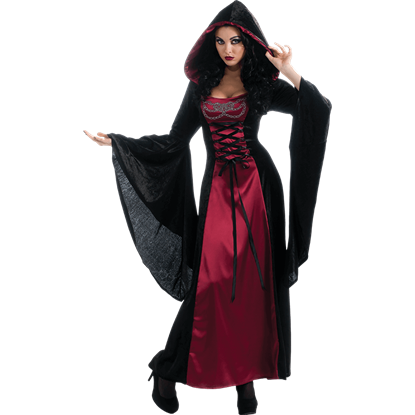 The Womens Gothic Enchantress Costume Dress features long bell sleeves that drape dramatically and a deep hood. Griselda slipped into the black dress, fastening the bat-shaped belt at her waist. She looked in the mirror and grinned, adding her favorite black hat. This Womens Griselda Witch Costume will make you the belladonna of the ball. 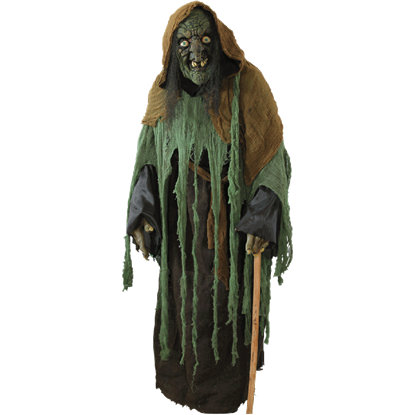 Hildegard was at the popular shop, Toadally Chic, when she saw the Womens Hildegard Witch Costume. Tying the sash at the waist, she knew the sleek dress with jagged hems would help her catch the eye of Newt, the warlock down the lane. The unrevenged dead do not like to stay within the confines of their graves. The Womens Salem Witch Costume allows you to act the part of one innocent victim of the trials come to express her murderous rage over her death. The unrevenged dead do not like to stay within the confines of the grave. The Womens Salem Witch Plus Size Costume allows you to act the part of one innocent victim of the trials come to express murderous rage over her death.